Wedyan organizes the second consultative meeting between civil society organizations and the Ministries of Planning, International Cooperation, Social Affairs and Labor on coordination mechanisms in humanitarian work Aden December 19, The Association for the Development of Society (the second consultative meeting between civil society organizations and the Ministries of Planning and International Cooperation, Social Affairs and Labor on coordination mechanisms in humanitarian work), aimed at identifying the main difficulties and challenges faced by civil society organizations related to the implementation of activities related to work In addition to strengthening the coordination between the civil society organizations and the ministries of planning and international cooperation and social affairs and labor and related bodies, where the organization has already organized the first meeting held four months ago, which was the results The second meeting was attended by 35 participants from the governorates of Aden, Lahj, Abyan and Dhala from the Ministry of Planning and International Cooperation, its executive offices, social and labor offices, representatives of banks and the governorate offices of the targeted governorates and civil society organizations. , Where participants discussed ways to strengthen coordination between all parties to facilitate and the success of humanitarian interventions. Participants called on the leaders of the ministries of planning and international cooperation to adopt the outcomes of the meeting and work to create links of cooperation, support and facilitation of civil society organizations In the implementation of its activities in the concrete humanitarian response. 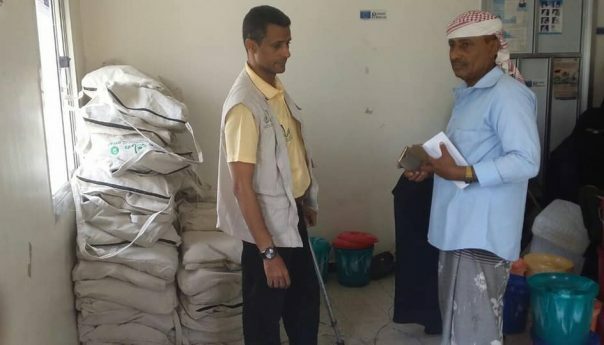 The first phase of the distribution of hygiene and hygiene kits in the village of Najd al-Barad in Al-Maqatira Governorate in Lahj Governorate reached 306 bags. This is the first batch of 3500 bags to be distributed to the beneficiaries in Al-Maqtara and Al-Maseemer Administrations which are part of the activities of the Water and Environmental Sanitation Project The project includes the construction of bathrooms, water networks and awareness campaigns for hygiene and cholera. The project was attended by Dr. Tameem Abdulraqeeb, project manager and Mr. Gamal Shamsan, Director General of Al-Maqtara Directorate, Chairman of the Local Council, who congratulated the efforts of Oxfam Organization in providing assistance and services to the residents of the Directorate. Secretary General of the Association of Wedyan participate in the regional workshop on “The role of civil society organizations in the accountability of international financial institutions Beirut: (22 to 26 September 2016 AD)” Wedyan Association for Community Development, participated by representing Engineer / Ammar Alshobe Secretary General of the Assembly in the regional workshop organized by the Bank Information Center, as of this workshop is designed to enable civil society organizations from the countries of the Middle East and North Africa region to participate actively with international financial institutions operating in the region , and follow-up activities and try to influence them and optimization of policies and mechanisms. Where participated in this workshop, 33 participants from seven Arab countries. The conclusion of the program is directed to children “be fine” Hosting and Diane Association for Community Development training program for children “be fine” Since the program aims to recover from the traumas of war and conflict.